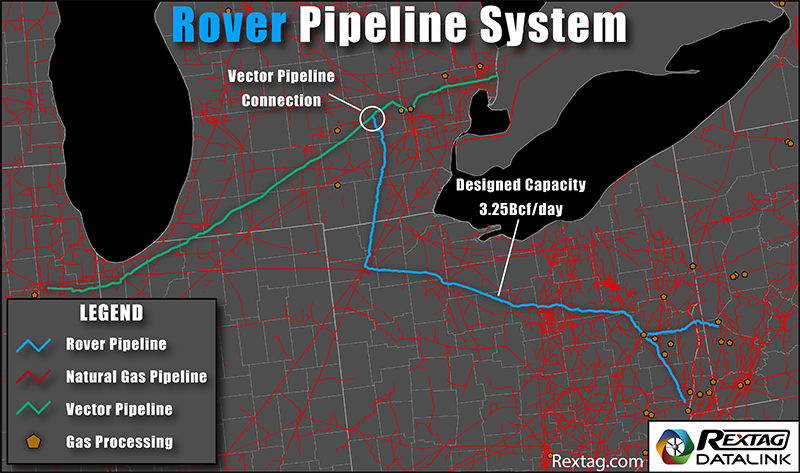 Completion of the Rover pipeline is not expected to be delayed by a U.S. federal order to stop new drilling to install pipe, Energy Transfer Partners LP said on Thursday. See the prospective pipeline route on our map. Read more details below. The company spilled more than 2 million gallons of drilling fluid - mostly water and clay - in Ohio wetlands in April during construction of Rover, prompting regulators to halt drilling in certain areas. The line, once finished, will have the ability to carry enough gas to supply 15 million U.S. and Canadian homes. The drilling ban will remain in place until U.S. Federal Energy Regulatory Commission (FERC) staff authorizes the company to start again. It does not prevent ETP from finishing drilling activities already started or other non-drilling construction.